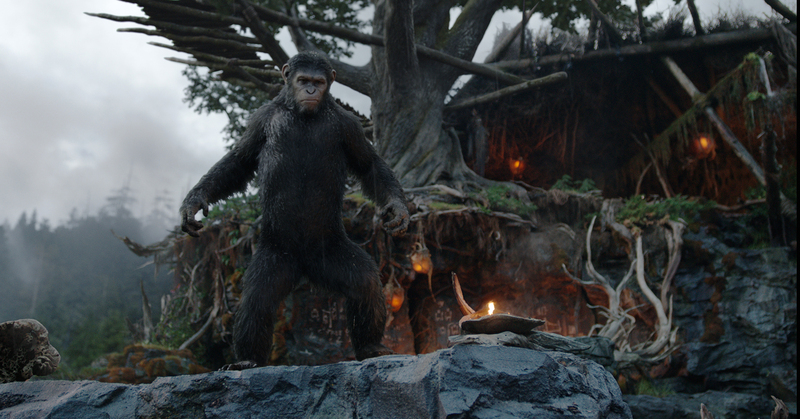 Serkis revealed that Matt Reeves, who replaces Rise director Rupert Wyatt at the helm, wanted to come in to the story at a time “where the apes weren’t fully evolved, where you can still enjoy evolution”. To that end, Dawn takes place 10 years after the events of the first film – which ended with the outbreak of a virus, which was termed the ‘simian flu’ – and in that time the Apes have formed their own society in the woods. The first bit of footage we were shown was an extended scene from the latest trailer, in which two apes come across Kirk Acevedo’s human. It’s a tense encounter that comes to a head when one of the apes is shot, and the sound awakens a sleeping Caesar. Arriving on the scene with a horde of apes, he stares down the humans and screams for them to leave, whilst sending a scout to follow. The following scene we were shown took place in the aforementioned ape colony, with Caesar and co. discussing how to respond to the human incursion. Serkis explained that “Caesar now has a family, a teenage son and an infant child”, and in the scene the ape leader stresses that the “home, family, future” they have built could all come under threat if they decided to go to war. 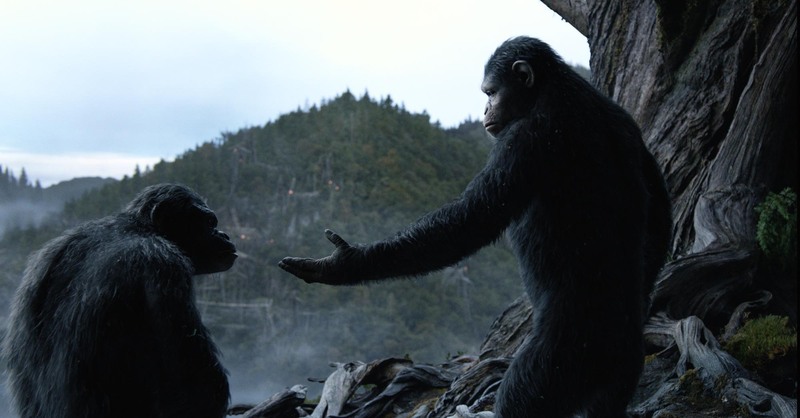 It looks as though Caesar’s capacity for empathy will be put to the test in Dawn, and the sequence ends with Koba – one of the apes who was imprisoned and experimented on by humans in Rise – promising to stand by Caesar but also recommending that they show their strength. Next, we got another tense face-to-face between humans and apes, this time on the human’s turf, and it ends with an authoritative Caesar delivering a very clear message: “Apes don’t want war, but will fight if we must”. Here’s where we get our best look at the human cast, which includes ape sympathiser Jason Clarke and human leader Gary Oldman as Dreyfus, who harbours a deep resentment for the apes as he lost his two sons to the simian flu. Indeed, on both sides there are those who want war and those who are keen to avoid it, and Serkis revealed that Reeves wanted to “balance it out so that you weren’t rooting for one or the other”. Interestingly, Serkis described Dawn as a peace movie, and stated the film will deal with themes of empathy, family, and prejudice. The next two scenes on offer depicted the possibility of peaceful co-existence between the species. Serkis revealed that this takes place in the aftermath of the Apes saving the humans who almost died in their attempt to restart a hydroelectric dam. Firstly Caesar’s baby chimp was shown to be playful with Keri Russell’s character, and then we saw a sequence where an ape called Maurice visits human campers in the woods. Kodi Smith-McPhee’s character gives him a book as a thank you for the apes’ at the dam, and the two flip through it together. The final bit of footage we were shown suggested that this peace won’t last long though, with a tantalising scene featuring two humans and an ape which goes from humorous to chilling in short order. It’s worth noting that the motion capture effects by WETA – at least, the shots which were complete – look phenomenal. There are a number of close-ups on Caesar and his kin that are immensely detailed, and married with what already looks to be great performances from Serkis, Toby Kebbell, Karin Konaval and more, it makes for both an effective and affecting experience. With a third film having already been announced, it’s not hard to figure out where the Apes franchise will ultimately end up (the clue is in the title). However, to quote Serkis himself, “it’s not about where we’re going, it’s about how we get there”, and by all accounts that journey will be both thought-provoking and entertaining. Dawn of the Planet of the Apes is released in UK cinemas on July 17, 2014. This entry was posted on June 6, 2014 by Amonymous. It was filed under Features and was tagged with Andy Serkis, Dawn of the Planet of the Apes, Gary Oldman, Jason Clarke, Karin Konoval, Kirk Acevedo, Matt Reeves, Toby Kobbell. This is so cool, Amon! I met Serkis a few years back and he’s a very likable, accessible guy. Wasn’t the biggest fan of Rise but really looking forward to Dawn. My friend Abbi from Where the Wild Things Are was also at this special screening!